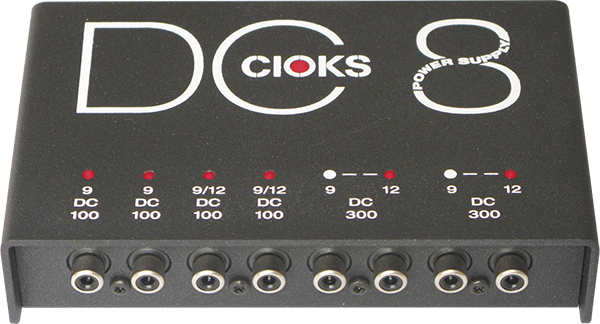 The highly anticipated and long-awaited CIOKS DC7 is the thinnest, most flexible and most unique power supply for powering effect pedals from the Danish power supply specialists CIOKS. The groundbreaking DC7 has a one-inch (25,4mm) profile and weighs 1.1 pound (500 grams) thanks to the pure 2-stage switch-mode technology inside. The profile may be low but the power ratings are certainly not – the DC7 puts out a maximum of 48W from its 9 outlets and allows the user to connect multiple high-current effects such as devices from Effectrode and Eventide without noise of any kind. • 2-stage switch-mode power supply topology. • Ultra-low noise achieved by multistage filtering. • 7 isolated DC-outlets, 6W each (660mA at 9V DC each). • 4 selectable voltages on each outlet. • 5V USB outlet with max. 1A. • 24V DC auxiliary outlet with max. 2A. • Individual power limit LED on all outputs. • Built-in true power meter showing the total load. • Global overload status LED. • Universal mains input voltage 90 to 265V AC. • Total maximum output power 48W. • Mounting hardware for Pedaltrain and Templeaudio boards included. • Compatible with CIOKS GRIP for drill-free mounting on Pedaltrain boards. • 12 Flex cables included. • Expandable with CIOKS 4, CIOKS 8 (coming soon! ), or other compatible units with 24V input voltage for additional isolated outputs. • Designed in Denmark, assembled in Poland.